Japan is a nation of sidewalk cyclists. By law cyclists are required to use the road except in areas where specially marked sidewalks are available. Japanese society has misinterpreted and massaged this law over the decades and now the general consensus is that cycling on all sidewalks is acceptable. So ingrained has the practise become that police no longer enforce the sidewalk cycling laws. As a result most Japanese have no experience of cycling on the road, and even in areas where attempts have been made to develop on road bicycle lanes they're still largely avoided as they've been implemented with no consideration for the actual needs of the cyclists they're intended to serve. 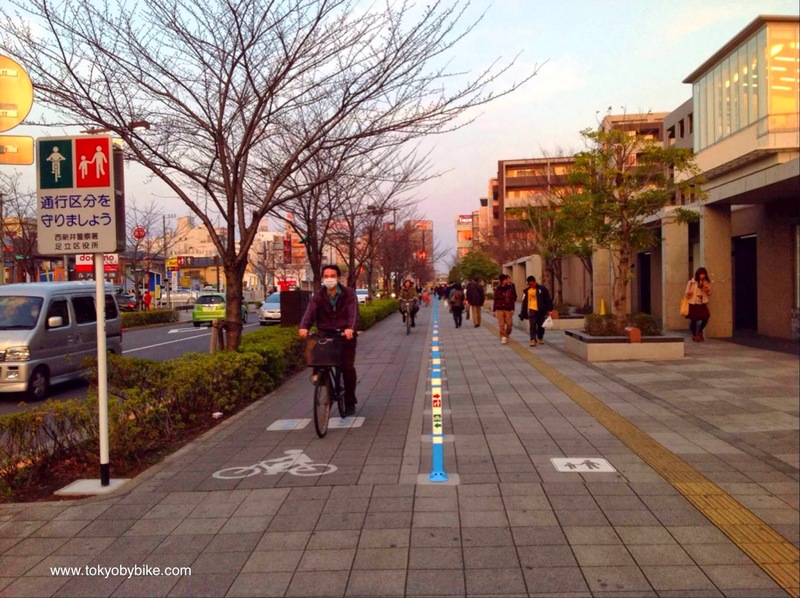 Japanese roads are not ready for cyclists, and Japanese cyclists are not ready for the roads. Bicycle Lane in Adachi-ku, Tokyo. When factories were demolished and the area west of Tokyo's Nishi Arai Station was redeveloped planners made the enlightened decision to provide wide sidewalks stretching 500m from the train station to the newly developed shopping centre. These sidewalks were paved with different coloured stones, the darker ones marking a two way lane for cyclists while the lighter area was designated for pedestrian use. Signs were erected and markings painted on the sidewalk surface indicating the correct location for both cyclists and pedestrians. With no physical barrier between the bicycle lane and sidewalk, no education, and no policing, pedestrians and cyclists alike were oblivious to the bicycle lane. Despite the markings pedestrians still walked wherever they pleased leaving cyclists with no option but to weave in and out often veering into the pedestrian only zone. Despite planners best intentions posting signs and changing the colour of the sidewalk surface did nothing to separate cyclists and pedestrians. Business as usual. This chaos continued for years after the development was completed, it seemed that planners had given up the battle. Upon visiting Nishi Arai last weekend I was surprised to see that a single simple improvement had been made to the lane which saw the bicycle lane almost entirely pedestrian free. Between the lane and pedestrian area posts had been erected at roughly 1.5m intervals. 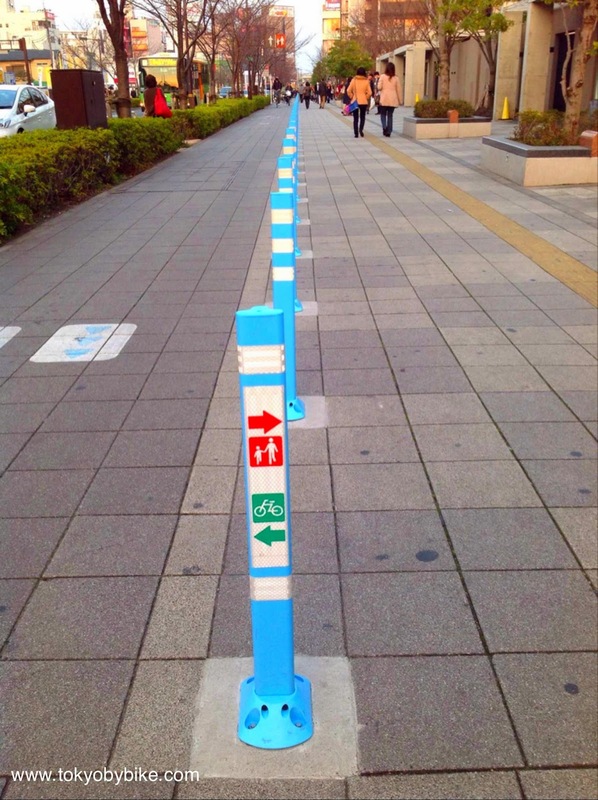 The bright blue posts, sport reflectors and markings pointing out the respective places for cyclists and pedestrians. The posts themselves are made from a soft rubber like material and when struck they bend and wobble rather than staying rigid. During my 500m walk beside the bicycle lane I observed just one woman walking obliviously in the lane, which she did for the entire 500m despite me remarking to my wife, numerous times, loud enough for the women to hear that "Some people still don't realise that's a bicycle lane!". Posts to separate cyclists and pedestrians. I noticed that cyclists, travelling in both directions, travelled faster than they had when they were mixed with pedestrians, some dangerously so as the posts pose no obstacle to errant toddlers who occasionally wandered into the bicycle lane. A small step or garden bed between would go a long way towards making it safer for all. Another problem arose at intersections where the coloured tiles of the bicycle lane and the posts suddenly stopped. It was at intersections where pedestrians and cyclists were forced to mix again quite dangerously as cyclists were passing through the intersections at higher speeds than they would had they been cycling amongspedestrians. Despite the problems the simple addition of posts effectively separated pedestrians from cyclists on a sidewalk where signs, markings and different coloured road surfaces had been proven a failure by years of demonstrated misuse. Why not just widen the roads and provide on road bicycle lanes you may ask? The practise of sidewalk cycling is so widespread in Japan it has become part of the culture, as is the belief that cycling the sidewalks is safer than cycling the roads. Japanese cyclists include children, the elderly and parents carrying multiple children on their bicycles none of whom are keen on sharing the road with fast moving, heavy motor vehicles with nothing but a stripe of blue paint for protection. In addition to this sidewalk lanes are convenient for shoppers as they're two way while on road bicycle lanes are typically one way. Imagine you're on a one way bicycle lane and need to cycle back to a store 50m behind you, its one way so you can't double back. First you have to cycle down to the next intersection (away from your destination), wait at some traffic lights and cross the road. Then you'll cycle back in the direction of the store you want to visit, but you'll have to cycle past it to reach an intersection where you can cross the road again. Having crossed the road you can finally cycle on towards the store. You've done a big circle, wasting a lot of time in dong so. On a two way sidewalk lane you simply turn around and cycle back. Easy. Most people in Japan use their bicycle not for travelling long distances from point A to point B, but for pottering around the neighbourhood stopping by the bakery before dropping into the fishmongers then dropping off some clothing at the dry cleaners. A 10km one way roadside bicycle lane from the suburbs to the city is of little practical use to 99% of Japanese cyclists. I believe it is important when considering cycling infrastructure to not simply accept what works well in other cities will work well in yours. Certainly there are best practises to adhere to but there is also a need to examine the culture, and the patterns of bicycle use and design infrastructure that complements that. Remember that cycling infrastructure is for people and you must understand how people use their bicycles before you can design infrastructure that they will gain the most benefit from. Do not blindly accept that what works elsewhere will work in your city. Cities, cultures and people are unique and the problems they face may require unique, customised, solutions. Keep this in mind when considering cycling infrastructure, build it for your people. Its interesting what the intersections look like http://goo.gl/zwq1Jp. It looks like pedestrians and bikes give way to side roads. Then compare to Dutch pootling to the street market http://goo.gl/fSBVGN. I'm confused what point you are trying to make in this blog. [I think] you say how the cycling infrastructure is inadequate, how the Japanese respond to their environment and then imply that good design won't always work here. Like Dutch infra? I'd argue Dutch cycling is sort of like pavement cycling except there is usually a bike path everywhere needed. They are like fast pedestrians https://tinyurl.com/CEoGBpedestrians. And here's bicycle users on the road next to said station http://goo.gl/2fxZmL =) Its a bit like the quiet streets of Groningen city centre, except for the air pollution.